Mix achiote paste, roasted garlic, rosemary and oil in large bowl. 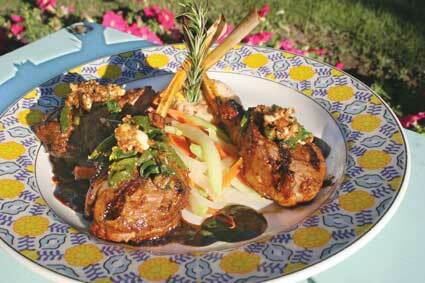 Marinate lamb chops overnight. Combine all ingredients in saucepan and mix (with the exception of the demi-glace). Bring to boil and reduce to half. Add the demi-glace. Simmer for 10 minutes. Strain sauce and season with salt and pepper. Boil potatoes until done. Add the chorizo and the remaining ingredients and mash together until a creamy consistency is established. Sauté vegetables in oil to desired doneness. Heat oil and add garlic and spinach, then add the cheese. Heat the grill to high. Remove chops from marinade and brush on both sides with oil and season with salt and pepper. Place on the grill and grill to medium-rare, let rest 4 minutes before serving. Place scoop of potatoes and garnish with rosemary sprig. Place vegetables as shown. Drizzle sauce around. Lean lamb chops on potatoes as shown. Top with spinach and cheese.